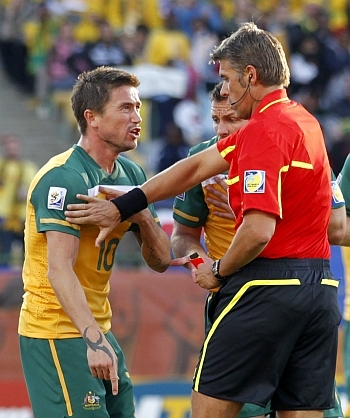 World governing body FIFA [ ] are allowing players from bigger soccer nations to get away with infringements on the pitch that smaller nations' players get punished for, Australia [ ] forward Harry Kewell has said. Kewell, who was controversially sent off in the Socceroos' 1-1 draw with Ghana at the World Cup for a handball on the goal line, said other teams were getting away with far worse at the tournament in South Africa [ ]. "What are FIFA doing about it when teams like us are getting hammered and the bigger teams don't?" Kewell told Australian media on Sunday. "We've been told to play the game fair and I think we do. "Nothing against the bigger teams but they're allowed to do it because of who and what they are," he added. Australia failed to make it out of the group phase at the tournament after a 4-0 drubbing at the hands of Germany [ ], in which Tim Cahill was sent off for a tackle that his opponent felt was unworthy of a red card. The Socceroos beat Serbia 2-1 in their final game, but were eliminated on goal difference. Kewell, whose total World Cup contribution was 24 minutes against Ghana before he was sent off, added that players from the biggers teams were not getting punished for diving at the tournament. Italy's [ ] Daniele de Rossi was pilloried by New Zealand [ ] media after his dive earned a penalty for the world champions in their 1-1 draw with the All Whites, while Kewell said a dive by Serbia's Milos Krasic in their game had also gone unpunished. "We were told simulation should be a yellow card -- but where was the card?" Kewell added. "I'm not having a go at him (Krasic), he tried to get a penalty for his team; but it went unpunished," he said.